Virtually every culture has theories concerning the movement of the Earth, the Sun and of the planets. Before the beginnings of modern science nearly all such theories were geocentric in that they put a stationary Earth at the center of the universe with the Sun, Moon and planets moving around the Earth. Given that the Earth people stood on appears to be fixed and unmoving, and that the Sun moves across the sky, it seems obvious that the Earth was not moving and that the Sun and other heavenly bodies revolved around the Earth. The first people who left us with a systematic and detailed description of the behavior of the heavenly bodies were the ancient Greeks. The system was called the Ptolemaic system after the Greek astronomer Ptolemy who lived around 200AD. The Ptolemaic system had the Earth at the center of the universe with the moon, sun, and planets orbiting the earth in circular orbits. Only five planets, not counting the Earth, were known to the ancient Greeks and they were believed to orbit the Earth in a special motion known as epicycles. 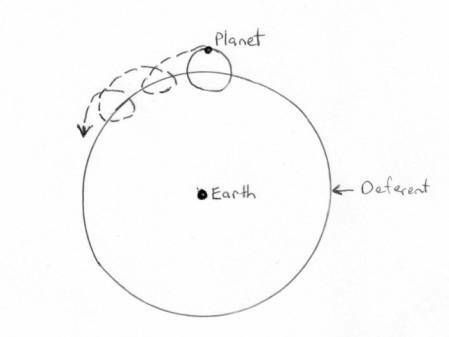 Epicycles were circles which planets were considered to move in when orbiting the Earth as shown by the diagram below. The Ptolemaic system required epicycles to explain the irregular movement of the planets which from observations made from Earth, which was moving around the sun, the other planets appeared to periodically change direction. The planets move in accordance with the broken line in circles that are identical to the epicycle around an overall orbit following the approximate line of the deferent. The ancient Greeks considered circles to be a perfect shape and that as everything in the heavens was perfect the heavenly bodies must move in circular orbits. The evidence available to the ancient Greeks was very much in favor of the Ptolemaic system with the Earth at the center of the universe. Not surprisingly the suggestion that the Earth orbited the Sun and spun on its axis was not accepted as the evidence was very much against that system. The Ptolemaic system was challenge in the 16th century by the Polish astronomer and mathematician Copernicus. Copernicus proposed that the Sun was at the center of the universe and the Earth and planets orbited the Sun in circular orbits. The apparent movement of the Sun and the stars and some of the planets was caused by the movement of the Earth, both spinning on its axis and orbiting the Sun, rather than the movement of the Sun, stars and planets. Copernicus still had to use epicycles to describe the planets orbits. Copernicus’s system did not really get adopted as it did not fit the observations any better than the already well established Ptolemaic system. Kepler using observations made by the Danish astronomer Tycho Brathe came to the conclusion that the Earth and planets orbited the Sun in elliptical orbits with the Sun at one foci of the ellipse. This enabled Kepler to get rid of the epicycles so as to create a simpler system. Kepler system worked, it fitted well with Tycho Brathe’s observations and also with observations that began to be made using the telescope which was invented about 1600. It was the invention of the telescope that allowed Kepler’s system to be confirmed. All astronomers were able to study the Sun, planets and stars with the telescope and observations were made which matched Kepler’s theory. Galileo was the first to make extensive observations of the cosmos with a telescope. He found the Moon was heavily crated, whereas previously it had been believed it was a smooth perfect sphere. He also discovered the moons of Jupiter showing not everything in the cosmos orbited the Earth. Galileo also made observations of the phases of Venus which were consistent with the Copernican theory and were inconsistent with the Ptolemaic theory. The new system which was to replace the Ptolemaic system was completed by Sir Isaac Newton and is normally known as the Newtonian system. Newton’s invention of the law of gravity and his three laws of motion described why the planets and the Earth moved as they did. In particular the first law of motion that a body in motion will continue in motion unless a force acts upon it describes why the Earth keeps turning on its axis and why it and the planets keep orbiting the Sun. Gravity explains what holds the Earth and planets in orbit around the Sun and stops them heading off into outer space while the Earth and planets motion stops gravity causing the Earth and planets to be sucked into the Sun. Gravity also explained the old problem of why objects not attached to the Earth, such as clouds and objects thrown into the air moved with the Earth. They were held in place by the Earth’s gravity. Newton’s system was dependent upon the prior invention of calculus, independently invented by both Newton and Leibnitz, which enabled accurate calculations to be made of moving objects such as planets, when the starting position was known. The Newtonian system was confirmed when Uranus was found not to be behaving in accordance with the Newtonian system which lead to the discovery of Neptune. The telescope had lead to the discovery of Uranus, in 1781 by William Herscel, the first planet discovered since ancient times. Observations of Uranus made it clear the planet was not behaving in the way predicted by Newton’s laws. Calculations were made independently by both Urbain Leverrier and John Adams that suggested the gravitational effect of another planet could explain the behavior of Uranus. This lead to the discovery of Neptune in 1846, exactly where the calculations predicted. When the gravitational force of Neptune was taken into account the whole solar system corresponded exactly to Newton’s theory. In the 19th century the development of spectroscopy which enables the identification of elements from the light they reflect revealed that the Sun had the same chemical make up as the stars and that the Sun was just another star. It only appears to be different to people due to the Sun being so much closer to us than the other stars. Newton’s system had been well established for several hundred years when it was discovered, with new and more accurate measurements that the planet Mercury did not move in accordance with Newton’s calculations. In 1905 Einstein published his special theory of relativity which described the universe but did not involve gravity. It dealt mainly with light and how the universe would look to observers traveling close to the speed of light. The special theory of relativity suggested the space occupied by an object would shrink in line with the movement of the object relative to the observer. It also predicted an increase in the mass of a moving object as its speed approaches the speed of light and time dilation which involves clocks that are moving running slower than stationary clocks. It also states that no object moving less than the speed of light could accelerate pass the speed of light. The special theory states that all motion is relative to the observer and that an observer not in a state of acceleration (i.e. in a constant velocity) can consider themselves at rest and are able to measure motion relative to themselves. The speed of light however was the same for all observers. The special theory of relativity has been confirmed in many experiments for example involving particles accelerated to close to the speed of light in particle accelerators. Special relativity was developed further when Herman Minkowski suggested special relativity meant space and time should be combined and understood as a four dimensional geometry of space-time. The general theory of relativity was published in 1916 and was a development from special relativity in that it deal with accelerations, while special relativity applied only to objects moving at constant speeds and in straight lines. General relativity states there is no difference between acceleration and gravity. Einstein provided a set of equations that shows that gravity and acceleration were equal to each other. The mathematics were based on non-Euclidean geometry which dealt with the geometry of curved surfaces and had only been developed in the 19th century. The general theory concerns the interaction of four dimensional space-time and matter. It states that matter produces a curvature in space-time and that all objects including electro-magnetic radiation move in accordance with the curvature of space-time. The curvature of space-time is caused by the presence of massive objects such as the Sun. The planets traveling around the Sun move in accordance with the curvature of space-time caused by the Sun. Due to this general relativity considers the planets move in circular orbits in four dimensional curved space-time rather than in elliptical orbits in three dimensional space as was assumed by the Newtonian system. Gravity according to general relativity is the curvature of space-time, a quite different concept from Newton’s idea of gravity. Newton’s concept of gravity was that everything with mass exerts gravity and the gravitational force depends on the amount of mass an object has and its distance from another object. The calculations involved with general relativity exactly explained the orbit of Mercury which was something that the Newtonian system could not explain. General relativity has been confirmed by some other experiments and observations and is now the generally accepted explanation of the universe. One problem with general relativity was that it assumed the universe must be either contracting or expanding at a time when Einstein and other believed the universe was stable. To solve this problem Einstein invented a mathematical device called the cosmological constant. However in the 1920’s Edwin Hubble discovered the universe was expanding, the galaxies were moving further and further apart and Einstein was able to drop the cosmological constant. Eventually the expanding universe lead to the big bang theory that all the matter in the universe once occupied a single point in space which then exploded scattering matter over the entire universe. that it became rational to believe in the Sun centered system. The invention of the telescope was dependent upon prior discoveries of the refraction of light as it moves through different mediums, particularly glass and how to manufacture glass of sufficient transparency. The invention of calculus also played a vital role in the establishment of the Newtonian system. The telescope was to lead to the discovery of Uranus and a combination of telescope and calculus was to led to the discovery of Neptune. Observations inconsistent with the Ptolemaic system caused the abandonment of that system and observations consistent with the Newtonian system lead to the adoption of that system. The same process can be seen with the adoption of general relativity. The orbit of Mercury was inconsistent with the Newtonian system but was perfectly explained by general relativity. General relativity was also confirmed when it was discovered that during a total solar eclipse light passing close to the Sun was deflected by the Sun’s gravitational field to an amount exactly as predicted by general relativity. The initial results of observations of a total solar eclipse in 1919 were somewhat ambiguous but were confirmed by subsequent eclipses. New observations were made either as the results of new instruments such as the telescope or improved instruments revealed Mercury’s orbit failing to conform to the predictions of the Newtonian system. New mathematical systems such as calculus and non-Euclidean geometry lead to a greater understanding of the universe. As new knowledge became available it would either support the existing explanation of the universe or conflict with that explanation. When new knowledge conflicted with the existing explanation of the universe it would lead to the development of new theories to explain the universe. It was ever increasing knowledge of the universe that lead to the abandonment of the Ptolemaic system and its replacement by the Newtonian system and the abandonment of the Newtonian system and its replacement by general relativity. Each of the three systems was an historical inevitability as the Earth centered Ptolemaic system was the common sense and obvious system for societies dependent upon naked eye observation. The Newtonian system with the Sun at the center of the universe was the inevitable replacement for the Ptolemaic system given the accuracy and power of 17th, 18th, and 19th century telescopes. It was not until the 19th century that it was realized that Mercury did not orbit the Sun in accordance with Newtonian theory. This was because the variation from the expected Newtonian orbit was extremely small and it was not until the 19th century that there were telescopes capable of discovering the variation. If the variation had been significantly larger then the Newtonian system may well have been replaced by general relativity somewhat earlier and with someone other than Albert Einstein being the inventor of the new system. If telescopes, when invented, were much more powerful and more able to show Mercury and other planets did not orbit the Sun as predicted by Newton then the Newtonian system may not have existed at all. Possibly a system such as general relativity may have directly replaced the Ptolemaic system or maybe there would have been a period of confusion at least until the invention of non-Euclidean geometry. It is the structure of nature that determines the power of telescopes when invented and their rate of improvement is effected by the structure of nature and the social institutions and culture of a society.